* Shoulder season Aug 15 to Aug 31. Peak season rates $175.00 from Sept 1 to October 15. **Children <15 years must join Family/Private Tour. Inquire for details & Family rates. Grizzly bear watching in Bella Coola is best from mid August into October, when dozens of grizzly bears congregate in the company of bald eagles and black bears to feed on spawning salmon throughout the Bella Coola Valley on BC's west coast of Canada, with the Atnarko River in Tweedsmuir Park being one of their densest congregation areas. Our guided grizzly bear watching trips in river drift boats and rafts provide unique opportunities to see grizzly bears and black bears from river level while they feed and fish for salmon on the rivers edge. Grizzly bear watching extraordinaire! The Bella Coola River is formed at the confluence of the Atnarko and Talchako Rivers, near the western boundary of Tweedsmuir Provincial Park, providing a natural transit route for grizzly bears to bisect the Bella Coola Valley's diverse ecosystems. 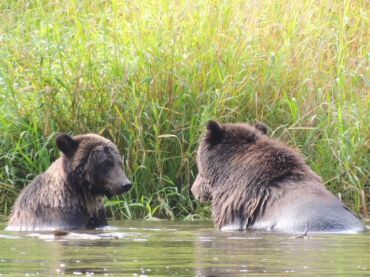 For a period of a few weeks in August and September, grizzly bears and black bears congregate along the river banks, stalking the Pacific salmon that will supply their energy and fat reserves for their dormant winter period. A bear viewing tour with Kynoch Adventures offers an unparalleled opportunity to see majestic grizzly bears in their natural habitat of the Bella Coola Valley. Our Grizzly Bear Watching & Wildlife Viewing tours are the perfect wilderness holiday activity. Tours are offered on the Atnarko River of Tweedsmuir Park where we drift in comfortable expedition rafts or rigid bottom dories in the Great Bear Rain Forest. Silently floating down the Atnarko River, we have the opportunity to observe British Columbia's wildlife in pristine habitat without disrupting the animal's natural behaviour. 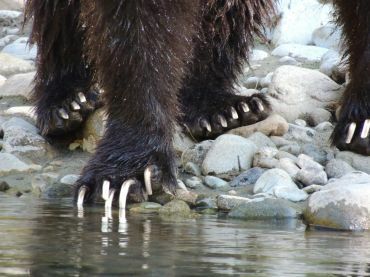 Unlike platform-based bear viewing, our bear tours are at river level, giving you a sense of being in the wilderness with the bears you are watching. Our Small Group & Private Tours operate in the same river section and are approximately the same duration tour. The primary difference in these two bear tours is the number of people in each boat. 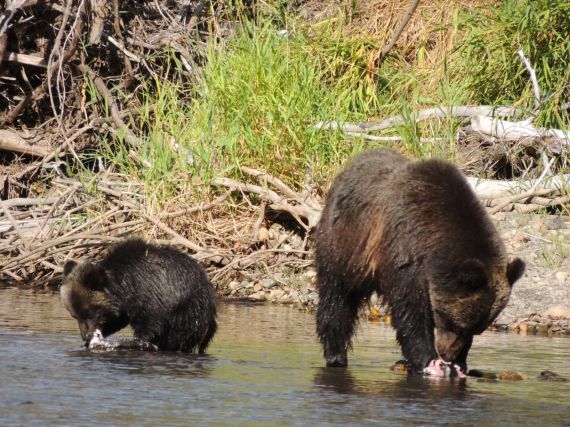 Join professional bear viewing guides and biologists for a memorable wilderness drift on one of the classic rivers of Canada, then return to comfortable lodging and accommodations at Bella Coola Mountain Lodge. For memorable adventure tours watch Bella Coola grizzly bears catching salmon, feeding on grasses, lounging on river banks and swimming in the clear Atnarko River. Our bear watching rafting tours are approximately 4-5 hours in length and suited to most abilities. Reservations required! Small Group Min. 4 guests (we will combine groups to accommodate numbers). Groups with Children <15 yrs inquire - private tours available.